Whether you shop online or at brick-and-mortar retailer this holiday season, you’ll undoubtedly be offered countless chances to save money with store-branded financing options offering “0% interest” for six, 12, 18 months. These can be incredibly tempting, but many people don’t realize they are often signing up for deferred interest accounts that can come back to bite you on the rear-end in a very nasty way. As opposed to true 0% interest offers, where you are not accruing any interest during the introductory promotional period, a deferred interest card account is actually accruing that interest during those months and you’ll have to pay it all if you haven’t paid off the balance in full by the end of the intro period. To illustrate the difference, use this example of an $800 computer. One card offers a true 0% interest offer for six months. A second card is a 0% deferred interest account for six months. Both have 20% APRs (which is about average for retailer-branded cards) after their intro periods. If you pay off that $800 before the six months is up, you don’t have anything to worry about in either case. But if you need a seventh month, the difference is huge. That extra month will only hit you with around $2 in interest for the true “0% for six months” offer. But if you need a seventh month and you used a deferred interest card, you’ll be hit with all of the interest that has accrued during the six months, which is around $55. 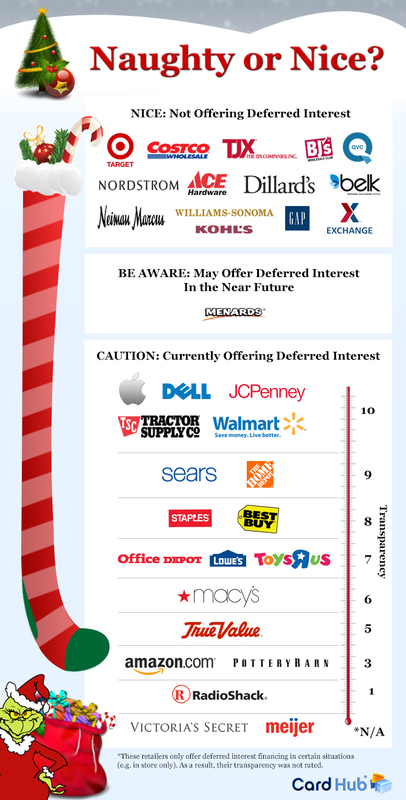 The folks at CardHub.com have put together their annual report on deferred interest cards, and the good news is that several major retailers — including Target, Costco, Nordstrom, Gap, BJ’s, and Kohl’s — don’t even offer deferred interest cards. Not that you should rush out and get store-branded cards from these retailers, but at least you’ll know you won’t be hit with the deferred interest. That said, many large retailers — including Walmart, Apple, Home Depot, Sears, Lowe’s, Macy’s, Amazon, Toys R Us, Staples, Best Buy, and Meijer — still offer these questionable cards, and the level of transparency varies wildly from store to store. On the one end are stores like Walmart and Apple, which earned the highest possible transparency scores, meaning that they do not go out of their way to hide the fact that you will be hit with all the interest if you have an unpaid balance at the end of the promo period. On the other end are Amazon and Pottery Barn, which earned shockingly low scores for the readability of the terms of their offers. RadioShack earned virtually zero points on the transparency test, placing it at the bottom of the list, but CardHub says that this may soon improve as the retailer transitions to a new website. Not only can deferred interest cards hit you in the back of the head if you don’t pay off the balance in time, that interest is often bordering on usury. Amazon’s deferred interest plan comes with an APR of 25.99%, Apple’s ranges from 22.99% to 26.99%. Other stores maxing out at 26.99% include Home Depot, JCPenney, Macy’s, Pottery Barn, and Toys R Us. Cards from Staples and Best Buy are even harsher, starting at 25.24% and going as high as 27.99%, but that’s still not the highest. Office Max/Office Depot accounts are fixed at 27.99%, RadioShack hits you with 28.99% interest, and Dell takes the high-interest crown, charging a maximum APR of 29.99%. Whatever card you choose, you should do everything you can to pay off your balance before that promotional APR expires. Credit card companies are banking that you won’t be responsible enough to do that, so prove them wrong.